Taken In: the cast of Government Inspector. Photograph by Ruphin Coudyzer. Occasionally one comes across a production in which the behind-the-scenes fun factor of the work spills out with such abandon and into the audience that it becomes immediately contagious. This is far and away the case with the current production of Nikolai Gogol’s Government Inspector, which in terms of the outrageous costumes and supremely developed characters bears comparison with Sylvaine Strike’s recent award-winning rendition of Moliere’s The Miser. In a sense, sitting in the audience of this Russian farce which has been worked over with a gentle South African veil of iconography, including bribery and foppery is like being in the actualisation of a novel by Franz Kafka, Günter Grass or Lewis Carroll (or a hybrid of the three). There’s a moment where it feels like you’re looking at a circus etching by Max Beckmann that has come to life. Director Jessica Friedan yields an understanding of the use of the artifice in theatre in Gogol’s work, which is simply delicious: There’s a line between funny and terrifying that most of the characters, including and especially the land owners, Bobchinsky and Dobchinsky, played by Dimakatso Motholo and Gillian Wittstock respectively, embody, thus carrying the work with a sense of Gogol veracity that will make you laugh. A lot. 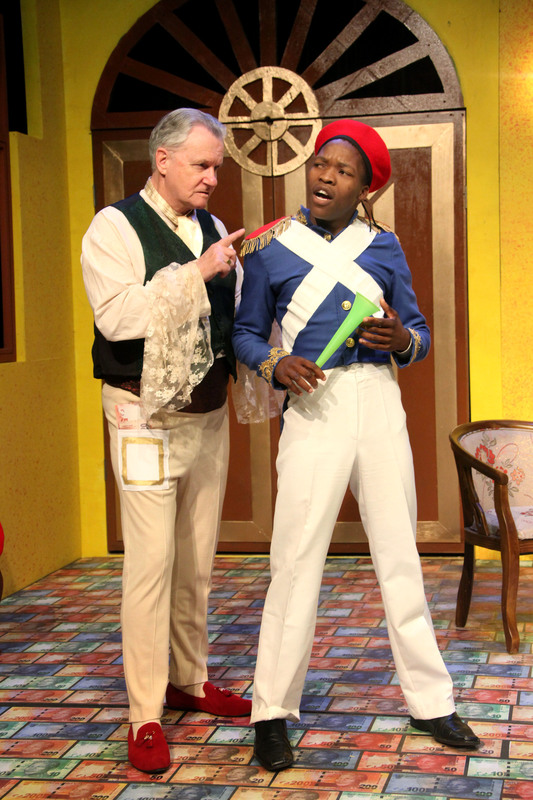 Government Inspector is the work of utterly fabulous collaboration and lots of enthusiastic nods must be cast in the direction of not only set designer Zewande Bhengu, but also the costumier, Andrew Hofmeyr. Their contribution both palpably assist in making the work the inimitable success it is: the level of creative freedom that is being swung in this work can only be described as outrageous, and it fills the interstices of this work with wisdom and savvy. But further to this level of loving the Russian dramatist who wrote so dirtily and wittily of parochialism 150 years ago, is the manner in which the narrative unfolds. Even the rolling in and out of different elements of the set, plays beautifully into the mix of a synthetic world view and the understanding that this is a play and not an attempt at real life. 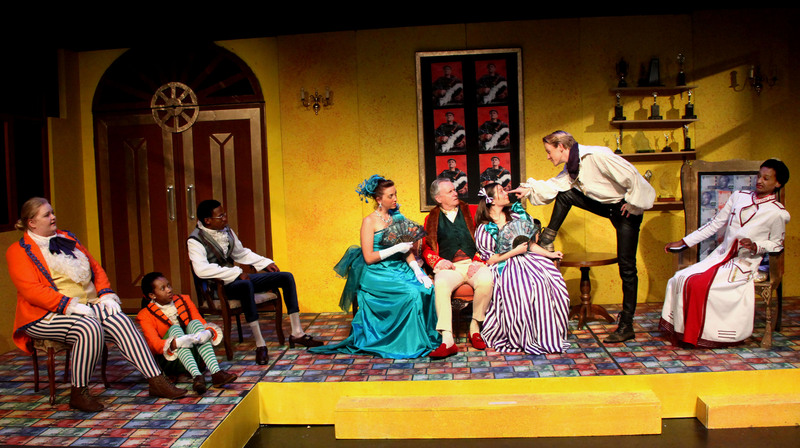 It’s a farce of the best kind, leaving the audience in the know, but the cast out on a limb: the mayor (Peter Terry) receives a notification that a Government Inspector will be arriving incognito to examine the town. Hysteria breaks out and ultimately the wrong person is not only fingered, but wined and dined, bequeathed and betrothed and celebrated for all the wrong reasons. Terry is a fabulous mayor – not only does he show us his superb acting chops (which we haven’t seen on stage for quite some years) – but he does so with a generosity of collaborative skill which makes you understand the benefit that his work brings to the younger performers. Matthew Lotter as Ivan Khlestakov is the other professional counterpart, and he whips up his character into a frenzy in all the right ways. Just short of corpsing all over the stage, he offers a reflection on this role of a scoundrel who lands by chance with his bum in the butter, which such largesse and energy, you will fall in love with the idea of him. Reading between the programme’s lines, the rest of the cast are students. There are some astonishingly fine performances here, and some weaker ones there, but by and large, this production is handled with such intelligence and professional focus that the lesser experienced or talented youngsters are swept off their feet and into the thick of the madness and brilliance of the tale. Clocking in at almost three hours, this is a highly watchable and frankly unmissable piece. The Mayor and the Police: Peter Terry and Lucky Mqoboli. Photograph by Ruphin Coudyzer. Government Inspector by Nikolai Gogol is adapted by David Harrower and directed by Jessica Friedan. It is performed by Zoe Beavon; Melody House; Matthew Lotter; Sabelo Makhubo; Campbell Jessica Meas; Nomathamsanqa Mhlakaza; Kirsten Mohamed; Obett Motaung; Dimakatso Motholo; Lucky Mqaboli; Jövan Muthray; Michelle Schewitz; Peter Terry; Searatoa van Driel; Saskia van Ryneveld; Gillian Wittstock; Jonathan Young; and Nonkululeko Zandamela and features production design by Andrew Hofmeyr (costumes); and Zewande Bhengu (set). It performs at the Downstairs Theatre, Wits Theatre Complex in Braamfontein, until April 30. (011)717-1376.